How many times do you think about your plumbing system before you toss an astounding quantity of waste down that kitchen sink? Do you give a second thought to the concern that the waste your dropping can damage the delicate plumbing system of your house? If not, you’re damaging your home plumbing system. Garbage disposal helps to keep the plumbing system in work without any damage. It breaks down the waste to make it easier to navigate the complicated and tight confines of the plumbing system of your house. You have to maintain and upkeep your garbage disposal so that it stays in good shape. If ignored, it can clog the pipelines, cause leakage and arise the need for repairs of plumbing system. This is not only a stressful process but also highly expensive. Clogged Drain: This is the most common garbage disposal problem. People drop whatever they want in the sink. You should at least know the difference between what you’re dropping in the sink and what can actually go down the sink. A little care and maintenance can avoid this problem. Solution: Disconnect the P or S shaped plumbing line following the discharge of disposal. Also, remove it from the discharging drain. Now clean whatever is clogging the drain. If there’s no clog, chances are that clog exists in the line connecting the wall. Use a plunger to dislodge the clog with water. Apply some force to work through the clog. If necessary, you can even remove the sink stopper. 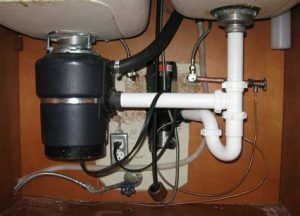 Leaking Garbage Disposal: Garbage Disposal can even start leaking due to force, if clogged for a long time. Leak is more likely to occur at places like top flange, discharge or dishwasher connection. You can deal with it yourself if it’s not that large or else, you may need to dial the phone number of your plumber to get it fixed. Solution: Turn off the disposal and remove it. Check if the mounting bolts are too tight. Replace the plumber’s putty with a new one and also replace the disposal and the flange. The hose clamp connected to the dishwasher inlet of disposer should be tightened to avoid dishwasher connection leak. Replace the hose if required. To avoid the leak in the drain pipe discharge, small some water after you tighten each bolt around it. If it leaks even after that, try replacing the gasket. Blocking of Garbage Disposal Blades: There are cases when the blades of garbage disposal stop moving. This can happen because of several reasons, the primary one being the clogging or blockage caused because of dumped wasted. So, make sure you’ve removed the blockage before you search for other reasons. Leak in the disposal bottom can also cause this problem. For this, you need to check the flywheel. Detach the flywheel using a hex wrench. Clean the flywheel thoroughly and remove any accumulated debris. You can also clean the impellers if you think they’re causing the problem. Sharpen the blades of garbage disposal, if possible. This will help avoid blockage in future. You need to take care of the disposals though. Jammed Garbage Disposal: When any waste gets stuck between the shredding ring and the impellers, it causes a humming sound. You can listen to the sound by flipping the switch. This ensures that the garbage disposal is jammed, and the clog needs to be dislodged. Solution: Turn the main switch off and try to dislodge the jam by inserting an offset wrench in the bottom slot of the unit. It becomes freed. Now try to free up the impellers using a broom handle or a dowel rod. Now turn on the switch and flip off the disposal several times while water flows. This will remove the blockage and jam. These were some of the most common problems that can be caused to your garbage disposal. You need to maintain it properly to avoid extra strain on your plumbing system. We hope this article helps you avoid and solve these problems.